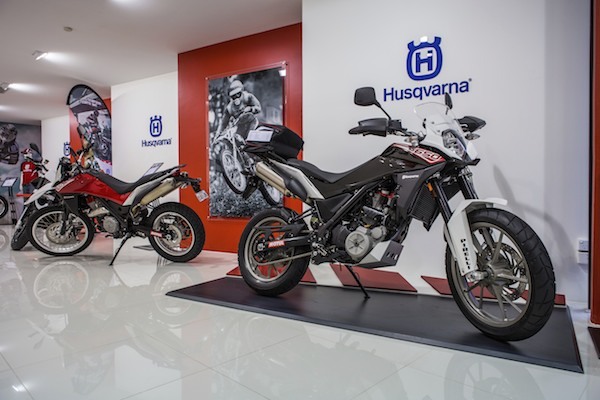 HUSQVARNA has recently launched two brand new models that are sure to shake up the Adventure bike market. 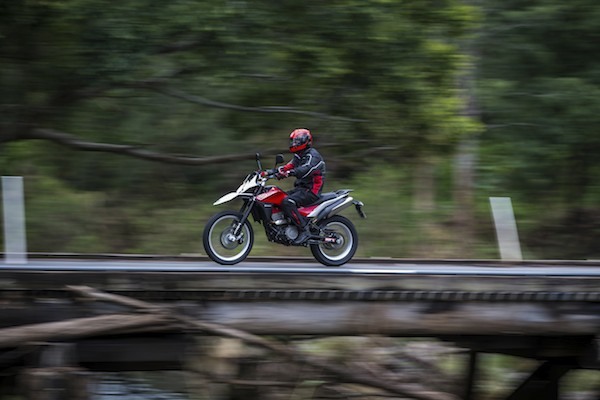 The Strada is intended for on-road use with some off-road capability, while the Terra is the reverse of that. The reality is there is a lot of crossover capability in both. They are light weight, built well and stylish – plus they will go just about anywhere. 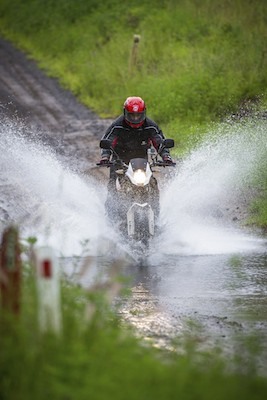 I spent two days with these latest additions to the Husqvarna stable in drenched southeast Queensland taking in sealed and dirt roads, swapping between the Terra and Strada to get a feel for what each could handle. The TR650 is based on the BMW G 650 GS but there are some major differences. Like about 10hp extra from the 650cc single cylinder engine and more than 20kg less weight for starters. First impressions count, and the initial feeling I had when I looked these bikes over is how well engineered they are. The styling, ergonomics and build quality are right up there. It is easy to forget that these bikes are intended for riders in the entry level price bracket. The single cylinder engine sits in a tubular steel frame and uses a five-speed transmission, producing a claimed 43kw (58hp) and 60Nm of torque. As a rough comparison this puts it somewhere between the Suzuki DR650 and KTM 690R on paper. 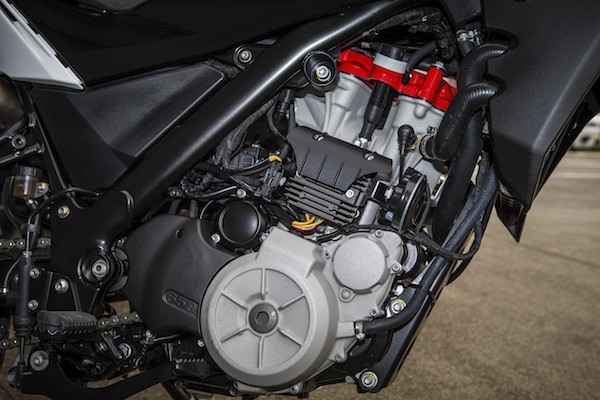 The extra horsepower comes from mild modifications over the GS version which include a lighter piston. The big claim here by Husqvarna is fuel consumption – 4.3km/l on the highway from the 14l tank, the same as the G 650 GS. Not bad if it is true. The running gear is all premium brand stuff, Brembo 300m single disc on the front and 240mm on the rear. Suspension is by Sachs front and rear, with 46mm upside down forks on the front (non adjustable) while the rear is adjustable for preload and rebound dampening. It’s also worth mentioning that both of these bikes can be configured as LAMS compliant. The easiest way to tell them apart is from the colour scheme. The Strada is black with red and white trim, while the Terra comes only in the traditional Husqvarna red and white. Other differences include braking – the Strada has ABS as standard, great for sealed road safety. The other major difference is in the wheels and tyres. The Strada sports alloy wheels with a 19″ 110/80 front and 17″ 140/80 rear. The slightly higher Terra has wire spoked wheels (which I think look cool) with a 21″ 90/90 front and 18″ 140/80 rear. This configuration difference is the most noticeable, the Terra also having much chunkier off-road styled rubber. The plan was to take both versions of the TR650 out on the back roads of the Gold Coast Hinterland, stopping over in a little town called Urbenville overnight. I spent the first stint from the Gold Coast out to Rathdowney on the Strada, taking in some tight sealed sections. The road was fairly damp but the Strada was very easy to adapt to. First impressions are totally positive although I will say that like most naked bikes, it isn’t so much fun sitting on highway speeds. 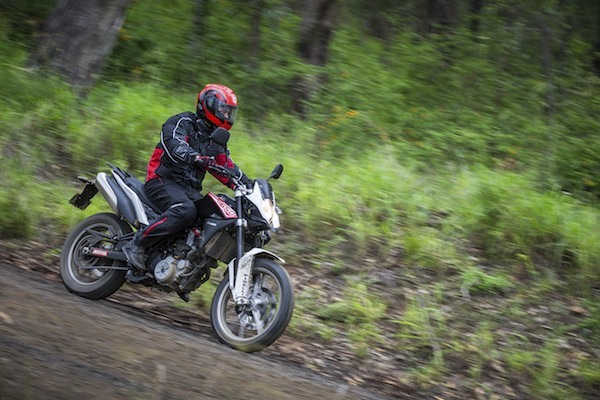 Let’s face it, with Adventure bikes the on-road capability is mainly to get you to the fun dirt tracks in some kind of comfort. Even though the Strada is classified as a roadbike, you can almost call it an Adventure bike because it holds up so well in the dirt. You can easily switch off the ABS and without doubt, this bike has no trouble soaking up the bumps. It’s no problem to sit on 100km/h plus easily and while the engine doesn’t have the pull of a 690R, it still has a fair amount of beans for a 650 single. The way Husqvarna has produced its ‘Red Head’ engine you end up with an extra 10hp or so over similar engines, and you can feel it. One thing I found is that both bikes work better the harder they are pushed. The engine feels like it performs best when it’s in the upper rev range and the Terra definitely felt better in corners when it was being pushed more. I first switched to the Terra during one of the dirt sections. I am a novice off-road rider and the roads we were on would be classed as typical for Adventure bikes. Nothing too technical but plenty of broken terrain and mixtures of surface. The Strada can handle these types of conditions no problem, but it is obvious the Terra can extend that bit further into the rough stuff. The lower ride height from the smaller diameter tyres (10mm doesn’t seem like much but you notice it immediately) and slightly softer suspension make it that much easier in the dirt. I guess it amounts to giving the rider a higher level of confidence – a better feel. The front suspension on both models is non adjustable which could be a real problem if Husqvarna stuffed it up. Luckily for us, everything is set up well for the happy medium and I found the handling to be forgiving and compliant. Having said that, to me the Strada felt more flighty in the front at higher speeds, where the Terra was more planted. This could be due to the stiffer suspension and alloy wheels – the trade-off being the Strada was much easier to tip into a corner. 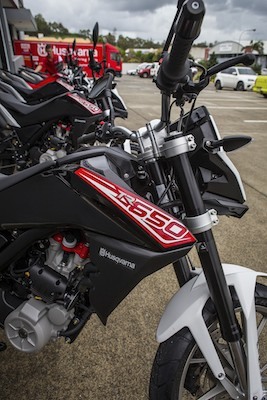 Much of a muchness really – two different bikes fitting two separate design briefs. Husqvarna is obviously well aware Adventure riders are accessory magnets and there is plenty of love to go around in that department. Practical love mind you. Plug and play heated hand grips are the thing that caught my eye, as well as a taller windshield and hand guards. Also available is an alarm, although the bike is fitted with an immobiliser as standard. There is factory hard luggage available and a soft rack bag. Given the practical design of the rear section, it looks as if there will only be a bolt-on plate required so you can fit your favourite soft luggage like the ‘Great Loop’ range. While the standard fuel tank will have a range of around 400km, Safari are also said to have a long range tank due to be released soon. Check the Husqvarna website for other kits as there is plenty available. The TR650 models put themselves right in the mix for their intended market, probably favouring progressive riders the most. If you are feeling your way into road riding, the Strada gives ample performance, especially when you push through the mid and upper rev range. A good bike to extend yourself on. The same could be said for the Terra off road. It feels too heavy to handle trail work, but it is much lighter than your big Adventure bikes and much more forgiving. For a novice in the dirt like me it is ideal and I am sure in skilled hands the Terra will carve up. The Strada comes in slightly more expensive at $9,995, mostly due to the ABS fitted as standard equipment. The Terra is slightly cheaper at $8,995. Husqvarna also injects a big shot of confidence in the form of a 24-month, unlimited kilometre warranty. As to which bike to choose, it really comes down to the surface you will spend most of your time on. If I was forced to choose I would prefer the Terra. There are no tricks to these bikes, they do everything the design brief says it will – and they do it very well. From Husqvarna’s point of view, the big key here is versatility and value for money. You really get the feeling everything is very deliberate in the design and a lot of thought has been put into the construction. The BMW influence is obvious and welcome – now it is time for riders to reap the rewards. Well production is no more…….safari has a tank that will get you 650+ km in sand! This bike..Terra is. fantastic worth even with abs $9100…lol!! The KTM guy is an idiot. no KTM will have the reliability of this bikes rotax… It will slowly become a cult bike.